Ginkgo Biloba EGb 761 is a standardized formulation of Gingko leaf extract, providing 24% flavone glycosides and 6% terpene lactones. EGb 761 has been approved as an herbal extract for medicinal use in Europe since the 1990’s. Ginkgo biloba is a popular herb that has been used in traditional Chinese medicine for thousands of years. It has been used to support cognitive function, mood, energy levels and sexual health. More recently, Ginkgo biloba extract has been studied for a range of health conditions, including chronic inflammation, cardiovascular disease, mood problems, and certain neurodegenerative conditions. Ginkgo biloba EGb 761 is one of the most widely studied forms of Ginkgo, with published data from hundreds of clinical trials and animal studies. This proprietary formulation is also known as Rökan, Ranakan and Tebonin in certain European markets. 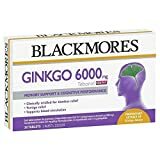 You can find the EGb 761 proprietary extract in the Blackmore’s brand of Ginkgo biloba dietary supplement. According to the manufacturer, each capsule contains 6000 mg of Tebonin, standardised to contain 29.4mg of gingko flavonglycosides, 3.5mg bilobalide and 3.7mg ginkgolides. This supplement is made without added yeast, gluten, wheat or preservatives and contains no artificial flavours or sweeteners. What Is Ginkgo Biloba EGb 761 Extract? When conducting scientific research on Ginkgo biloba, scientists must use a standardized form of the supplement to ensure that they can compare results across study sites or projects. One of the most commonly used forms of Ginkgo in scientific research is known as Ginkgo biloba EGb 761. This refers to a standardized formulation of Ginkgo that contains a known quantity of its active ingredients. Ginkgo biloba EGb 761 extract includes 24% Ginkgo flavone glycosides – made up of quercetin, kaempferol and isorhamnetin. This product also contains 6% terpenoids – composed of ginkgolides A, B and C, and bilobalide. These are the active constituents in Ginkgo biloba that are thought to underlie its beneficial effects for human health. EGb 761 was developed and manufactured by Dr Willmar Schwabe Pharmaceuticals in Europe. In the United States, it is sold by Nature’s Way under the name “Gingold”. There are a number of other standardized formulations of Ginkgo Biloba extract on the market. Many of these also contain a 24% flavone glycosides to 6% terpene lactones ratio. However, many consumers prefer to buy supplements with EGb 761 to ensure they are receiving a high-quality product. How Does EGb 761 Ginkgo Extract Differ from Ginkgo Biloba Supplements? There can be significant differences in the concentration of active compounds in different Ginkgo biloba supplements. Any product that contains an extract from Ginkgo leaves can technically be sold as a Ginkgo biloba supplement. However, not all of these products contain the optimal concentrations of active ingredients, Ginkgo flavone glycosides and terpenoids. Thus, the effectiveness of these supplements may not be the same as the formulations used in scientific research. Products that contain EGb 761 have been widely researched and are formulated to provide a standardized ratio of active compounds. This product provides a ratio of 24% Ginkgo flavone glycosides and 6% terpenoids, which has been established as the optimal potency. EGb 761 is known commercially as Tebonin or Rokan. According to the Natural Medicines Database, Ginkgo biloba is rated as Possibly Effective for Vertigo, Tardive Dyskinesia, Schizophrenia, symptoms of Premenstrual syndrome (PMS), Glaucoma, Peripheral vascular disease (PVD), Diabetic retinopathy, Dementia, Cognitive Function and Anxiety. According to research studies, Some patients show benefit when taking EGb 761 for tinnitus (1). The mechanism supporting this effect is unclear. Although not all patients consistently benefit from taking EGb 761 for tinnitus, it may be an effective form of treatment for those who are seeking a natural alternative to other treatments. Several studies investigating EGb 761 for anxiety have shown that it has beneficial effects (2). In at least three studies, taking Ginkgo EGb 761 for anxiety resulted in lower self-reported anxiety symptoms after four to eight weeks. Whether the supplement has longer term benefits and can prevent relapse of generalized anxiety disorder has not been studied at this time. Scientific studies have found that taking EGb 761 results in a prolonged anti-inflammatory response and prevents the accumulation of platelets (3). Patient reviews of Ginkgo biloba EGb 761 suggest that it may be taken to reduce inflammation associated with chronic disease. Despite positive results from some research studies, the FDA has not approved the use of Ginkgo Biloba as a drug for the treatment of any specific medical condition. Many of the traditional uses of this herb have not been validated. Ginkgo biloba has long been thought to reduce risk for Alzheimer’s disease, causing some people to buy EGb 761 to prevent this disease. Although there is not enough scientific research at this time to suggest that EGb 761 prevents Alzheimer’s disease, the supplement does have some neuroprotective effects (4,5). In animal studies, this Ginkgo biloba extract may reduce oxidative damage and enhance the effects of certain neurotransmitters. Patient reviews of Ginkgo biloba EGb 761 efficacy for neurodegenerative disease are not yet available. The effective dosage of Ginkgo biloba EGb 761 depends on the primary complaint as well as specific patient variables. In general, dosages range from 80 to 240 mg of Ginkgo biloba extract daily. However, higher dosages may be warranted in some conditions. For example, a patient taking EGb 761 for anxiety may use 240 to 480 mg daily for up to eight weeks, as these are the doses that have been reported to be effective in the clinical literature. It is best to take Ginkgo biloba under the guidance of a medical professional who can recommend an appropriate dosage for your specific health needs. Patient reviews of Ginkgo biloba EGb 761 suggest that this supplement is very well tolerated. The most commonly reported side effects include gastrointestinal distress, headaches, dizziness, or mild nausea. In rarer cases, hemorrhagic events or cardiovascular incidents may occur. It is also possible to experience an allergic reaction to EGb 761 Ginkgo extract. Symptoms of an anaphylactic reaction may include hives, difficulty breathing, dizziness, or airway constriction. The long term side effects of Ginkgo biloba EGb 761 are unknown at this time, although this formulation has been given to patients in clinical research trials for periods up to six years without ill effect. Ginkgo biloba may not be safe when taken with certain other medications or supplements. Before taking EGb 761 for tinnitus, anxiety, inflammation, or another health problem, talk to your doctor about your current medications and any possible contraindications. Ginkgo biloba EGb 761 may not be safe to take with antidepressants, diabetes medications, anticoagulants, talinolol, antiplatelet medications or herbs, warfarin, or St. John’s wort. Morgenstern C, Biermann E. The efficacy of Ginkgo special extract EGb 761 in patients with tinnitus. Int J Clin Pharmacol Ther. 2002 May;40(5):188-97. Woelk H, Arnoldt KH, Kieser M, Hoerr R. Ginkgo biloba special extract EGb 761 in generalized anxiety disorder and adjustment disorder with anxious mood: a randomized, double-blind placebo-controlled trial. J Psychiatr Res. 2007 Sep;41(6):472-80. Kudolo GB, Wang W, Barrientos J, Elrod R, Blodgett J. The ingestion of Ginkgo biloba extract (EGb 761) inhibits arachidonic acid-mediated platelet aggregation and thromboxane B2 production in healthy volunteers. J Herb Pharmacother. 2004;4(4);13-26. DeFeudis FV, Drieu K. Ginkgo biloba extract (EGb 761) and CNS functions: basic studies and clinical applications. Curr Drug Targets. 2000 Jul;1(1):25-58. Bastianetto S, Ramassamy C, Dore S, Christen Y, Poirier J, Quirion R. The Ginkgo biloba extract (EGb 761) protects hippocampal neurons against cell death induced by beta-amyloid. Eur J Neurosci. 2000 Jun;12(6):1882-90.